The Taoglas FXP280 868 MHz ISM Antenna covers from 863-870 MHz used in the 868MHz ISM (Industrial Scientific Medical) European Band. The antenna has been designed in a flexible material with a square form-factor and cable connection for an easy installation. 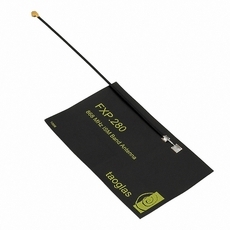 The antenna works on different plastic materials and thickness. We have selected a piece of ABS with 2 mm of thickness as a baseline for testing.